"Arabs condemn Israel's aggression", that's what a newspaper reported after the killings of scores of youth and children. One doesn't know how to react to such statements. Tonnes of ink has been wasted in the Indian sub-continent alone on what we call in Urdu, the 'be-hisi' (apathy) and khamoshi (silence) of Arab rulers. So what is surprising now? Even my non-Muslim friends ask me why these states don't speak, why people don't come out on the street like in Indian sub-continent. And questions like why the oil not used as weapon? There are so many arguments, counter-arguments and reasons for the silence in Arab street as well. But I don't think over it simply because Palestinians have suffered for decades. Not only Israel but entire Middle-East and the Arab world has been humiliated by United States of America through support to Zionist state's terrorism. I don't know whether the Arab states fear that support to Hezbollah would in turn help Shias and led to growing influence of Iran in the region. Or that they are too dependent on America as their monarchies exist due to its support. But if the states of Middle-east and their people are still not angry and 'humiliated enough' at the constant suffering of their brethren then why should I cry. It should have been their war, their cause. It is no shock that monarchies of Arab world don't take a strong stand, we are used to all this for decades. They have their own paradises on this earth. If they are not affected by the disturbing reports and images then there is nothing left to say. The real Arab is invisible. Expecting those to act who dared to change the Muslim world's Arabia (the Prophet's Arab) to Saudi Arabia, the Arab belonging to a family, The Sauds. I don't expect them to act. And I don't wish to wail further for the plight of Palestinians, Lebanese and others. Surely those who are fighting the aggression will continue to do so. Qana is no first such incident but one must stop looking at Saudis or anybody else. 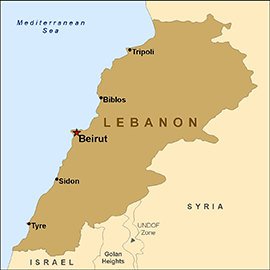 I am sure those spirited Lebanese and Palestinians will continue their fight. Neither Israel can fight for eternity. And I can just pray to God in private, nothing else. The aggressor will surely lose some day. Watching Kalyan Singh on television [India TV], I wondered how easily people in public life take somersaults. The former Uttar Pradesh chief minister said that he was proud of the events that occurred on December 6. I wondered how people like Singh and his ilk keep cheating us. If he was genuinely proud of Babri masjid demolition, why did he regretted that after leaving the BJP and joining the Samajwadi Party. At that time he was blaming LK Advani for hatching the plot. Sakshi Maharaj who took credit for demolition earlier had also changed the statement and overnight TURNED SECULAR when they aligned with SP. Sakshi Maharaj was recently expelled from the Parliament during the MPLADS scam [sting operation]. If you are proud of demolition of the mosque then be proud, why compromise your ideology just for the sake of political survival. But no, they are such liars that they take us all for a ride and even the anchors of news channels don't have the guts to ask them why they lie so much. Strange: LK Advani keeps on claiming that December 6 was the saddest day of his life and the born-again Hindutva-vaadi Kalyan Singh says he is once-again proud of the incident on December 6. Terrible and shameless multiple-speak. Unfortunately we all forget how they stoke communal passions just for personal gains and elect these liars to our parliaments and assemblies. There should be space for rightist and leftists in the politics of our nation but there should not be any space for LIARS. Kitna jhoot, kitni makkari? Then we all discussed Faiz. I read the nazm again. 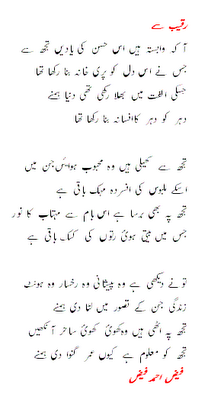 The concept of Raqeeb in Urdu poetry is unique. Raqeeb is one's rival in love, the person who is also in love with your beloved. It is a strange relationship with several emotions and elements involved but this particular poem 'Raqueeb se' is different. Here the poet looks at Raqeeb with the nostalgia and remembers the raqeeb for also loving his beloved, competing with him for the same love, sharing the same emotion and addressing him as a person who alone can understand his plight and passion. Seemab Akbarabadi's above-mentioned ghazal is one of my favourites. The first couplet is considered one of the ten most popular ashaa'r in Urdu poetry in the last century. Aashiq Husain 'Seemab' was born in Agra in 1880. He was employed with railway but due to his passion for poetry quit the job and returned to Agra and published/edited well-known journals. He had set up a full-fledged college of poetry 'Qasrul Adab' and had hundreds of disciples. Seemab had written 284 books in his life. He died in 1951. His son Ejaz and later grandson Iftikhar Imam Siddiqui carried the legacy. The well-known Urdu magazine Shayar (or Shair as the magazine prefers) is regularly published from Mumbai and has completed seventy years. Roznama Rashtriya Sahara launched its (Urdu edition) newspaper from Patna. It's after a long time that a national daily of Urdu has gone to Bihar. Long back the Qaum Awaz, when it was expanding, had an edition from Patna. The Rashtriya Sahara has been expanding fast and Urdu editions in Mumbai and Kolkata were launched recently. The Hindi edition of Sahara has been launched as well from Patna, that has a huge unexplored readership. Prof. Matuknath, who taught Hindi in Patna, hasn't faded from TV screen ever since his disgrace that was beamed live into our drawing rooms [and the subsequent redemption] in the first week of July. The 55-year-old professor and his relationship with his student-girlfriend Julie was lapped up by TV channels. First his wife beat up his girl friend Julie, who is barely 25, after she found them together. The poor professor's face was blackened publicly and the entire nation watched it on most of the channels. He was taken to police station. Julie remained adamant that her love was divine and media morality shouldn't guide the lives of people. Then the stories of Matuknath and Julie forgetting the humiliation and going on a joyride in a rickshaw in Patna appeared and television channels showed it again. The anchors were surprised that they were not apologetic and hadn't run away, rather moving around freely. The reports were repeated every hour through out the day. The 'odd-couple' went to a Shopping Mall and that was also on all channels. Psychologists were called, panel interviews were held and impact of such a relationship on society was discussed. However, that was not the end of Matuknath's saga. He returend to college after all humiation and surprise, the students had a sudden change of heart and they took him to the class on their shoulders. They claimed victory for his love. Stories about his NRI son criticising his father [his LIVE interview] were telecast meanwhile. That was not the end as the class in BN College where Matuknath devoted the period to love and Julie was seen sitting among students, was aired on most channels. Special 30 min-1 hr long programmes were shown on Ajtak, Star, Sahara, ETV, NDTV, CNN IBN, India TV and all national television channels. 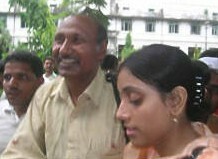 But then the college administration felt it was too risky to let Matuknath continue as professor. He was suspended due to 'infamy' he brought to the college. 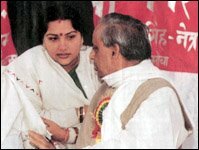 But then the lovebirds reached Lalu Prasad Yadav who blessed their love. This was also a NEWS. Devoid of real issues the media groups boosted their TRPs focussing on this affair. The voyeuristic instincts of the viewers that have already grown an appetite for such stories thanks to soap opera news culture of these channels were catered well. For a fortnight the love affair has been explored with all angles. The magazine Matuk and Julie brought out, its special issue on marriage and their views. But this doesn't seem to end. Some praise Julie for her courage and dedication to the Professor, rest are just enjoying a peek in other's life--humiliation, disgrace, broken family, allegations and counter allegations. You may not have heard about many Urdu poets from the mico-minuscule Zoroastrians [Parsis] community in the country. But we surely know that a Parsi doctor is now getting acclaim for his Urdu poetry. 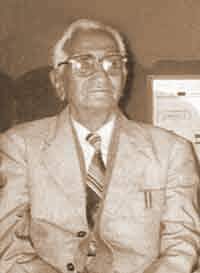 The poet's name is Dr Navroze Kotwal. The couplets do reflect his command over language as well as his humanism. Parsis are a small minority in India but have made contribution in all fields. Now, we have a poet making his mark in Urdu literature. Perhaps, there may be Urdu poets from the community in Pakistan, but we don't know many Parsi poets in India. The Afternoon Dispatch and Courier has printed the story and his photograph. Dr Kotwal reads Hamaari Zubaan paper that is published by the Anjuman Taraqqi Urdu Hind. Unfortunately the name of the correspondent who wrote this report is not mentioned as he too deserves to be congratulated. They were serving life term in prison and their children in the outside world attained marriageable age. The marriages were fixed in jail. Like son of a prisoner married to daughter of another prisoner so that none of the children would ever have to bear the stigma of being called convict's son or daughter as both husband and wife would be son (or daughter) of jail inmates. But Haroon Khan couldn't have ever imagined attending his daughter Zeenat's marriage and the jail authorities decided to hold the wedding on jail premises so that he and other prisoners like him could participate in it. Zeenat was married to Javed (son of another convict lodged in jail ) and the entire jail administration, minister and bureaucrats were all present to bless them. The employees of jail decorated the prison and were like baraat. Similarly, Sarita's marriage was solemnised with Kishor, both also children of convicts. Qazi came for nikaah while pundit conducted the marriage of the Hindu couple. Many other couples were also married. All of them had their fathers in jail and they couldn't have imagined that the confines would turn into a place of celebration for the entire family. Interestingly, apart from basic household goods like utensils, kitchenware and television set the Hindu and Muslim couple got gifts as per their tradition from government. Batua, Paandaan, Gharaara, Shalwar Suits to Muslim couples and Mukut, Kataar, Saari, Tika to Hindus. The feast was also held and the band played tunes. It was such an unbelievable event that even after years I would feel genuinely happy recalling the event. how many are able to see it clearly? Rafaqat Husain, a young man in Moradabad, put his wife on stake during a gambling session. He was losing for hours and his 'friends' asked him to dare put his wife. Rafaqat didn't seem to mind at all. Rafaqat lost his wife Mahjabin. His 'friends' were not the one to let the opportunity go and like modern Kauravas went to his house to take away the 'property' that had just won. The incident occurred recently. 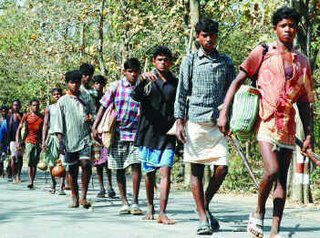 However, the village elders intervened and a panchayat meeting was called and it was decided that though Rafaqat had himself lost his wife, he should retain his wife. 'He has sinned and God would Himself decide his fate and punish him', opined the panchayat. Even if he had lost his wife, the chutzpah of the youths who came to drag away his wife is amazing. For a change though, a panchayat in Western UP gave a sane judgment. The manner in which men deem wife as their property hasn't changed and the moral of the story of Pandavas and Mahabharata has little affect on us. 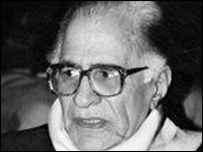 I tuned in to the BBC urdu service yesterday morning and heard the news 'legendary Urdu poet Ahmad Nadeem Qasmi is no more'. He was the last of the legends of Urdu literature who were born in the first quarter of the last century. I don't think any such era in any other language would have seen such a galaxy of poets and authors who were so popular with masses. Literature was no longer confined to a certain class then. Majaz, Faiz, Jazbi, Makhdum, Akhtarul Iman, Sardar Jafri, Kaifi, Majrooh, Jaanisaar and scores of others had appeared on the scene in the 30s. Poets like Josh, Firaq and Jigar were a toast of the nation. The classical masters like Seemab, Yagana Changezi, Safi Lucknowi, Hasrat Mohani, Jamil Mazhari and Asghar were all at their creative best. And Allama Iqbal's poetry echoed everywhere. Ahmed Nadeem Qasmi (1916-2006) was almost 90 and had a creative life of seven decades. Intezaar Husain rightly said, 'He was the last of the great personalities that emerged during Progressive Writers' Movement and now there is no one in the Urdu world anywhere near his stature'. 'Ehtaraam, ehtaraam, ehtaraam...Ahmed Nadim Qasmi bazm meN tashriif laa rahe hain' that was how Fikr Taunsvi had once described his personality. 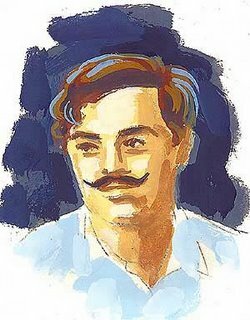 'Shama-e-tanha ki tarah, subah ke taare jaise/ Shahar meN ek hi do honge hamaare jaise'--Irafan Siddiqui (1939-2004) was probably the most important poetic voice to emerge from Uttar Pradesh in the last few decades. It was only in late 80s that he got pan-Indian popularity and surprisingly was more popular in Pakistan. He never participated in 'mushairas' and kept aloof. It was not until that Naiyar Masud (prose) and Shamsur Rahman Faruqui (critic) formed a close association with him that this unique poet was re-discovered by Urdu world. He had avid interest in Sanskrit and had translated Kali Das' works Malvika Agnimitr and Rupsingar in Urdu. In the aftermath of partition, when Muslims who had remained in India were feeling increasingly insecure, Urdu poet Jagannath Azad (son of renowned poet Tilok Chand Mahroom) had written this legendary Nazm. after battling with cancer for long. He was 86. As a child some of the couplets I was too familiar with because I had heard elders recite them regularly were of Pt Brijanaryan Chakbast, whose name was taken very respectfully in Urdu-speaking houses. He belonged to a Kashmiri Brahmin family that had settled in Faizabad. He spent most of his life in Lucknow, where he had a thriving practice of law. He was associated with Home Rule movement. Chakbast lays emphasis on character building. An elderly Jain monk killed himself of starvation in Bhind in Central India and thousands gathered from cities nearby and other states to attend the 'great event'. After he died, the body was taken around in a decorated vehicle around the town and it was near-celebration. The monk Kshamasgar had stopped taking food earlier and then quit water also. As news spread, the people kept pouring in. Had it been an ordinary person sitting on hunger strike police would have taken him away, booked and forced him to eat because it is almost a suicide. However, the debate over this Jain tradition 'santhara' continues. It is also known as Sallekhana. Often elderly females who become 'useless' to family are urged by family members to go for that--the Tehelka had done a story on that in extreme detail. However, the tradition continues for thousands of years in India. Jains being the rich merchants and due to their clout in media and politics no body speaks on this practice. The Women Commissions often speak on the issue when females do it or girls are turned Jain sadhvis at the age of 8 or 10 and have to live a full life of asceticism. But none dares speak. After VHP is dominated by Jains. While in most communities and small sects, at least a couple of voices of dissent are heard about practices, not a single voice from within Jains is heard on the issue. Israel attacked Palestinian Prime Minister's office and damaged it. The airstrikes are getting fiernce. In Gaza buildings, power stations, bridges were destroyed. Strangely, this action which Israel calls 'collective punishment' has failed to attract our attention in India. Indian government and media seem detached. What I am worried is that newspapers are not just concerned, they may take sides, but they should report. Its a big humanitarian crisis for Palestinians. Unfortunately in India, we have seen how during the cold war everything wrong was attributed to CIA and US while there could be nothing wrong about Russia [USSR] then. In those days, the journalists and writers who went to Russia and returned would write romantic details about the country like a girl who held spade or worked in factory and in the evening went for a date and during the night read literature--epitome of civilised society. Similarly, once Israel was eternal enemy for us. So much that we didn't play sports with them. Remember how it was only after Rajiv Gandhi's intervention that we could play Israel in the Davis Cup. As long as Yasser Arafat was there he bonhomie remained though since Narsimha Rao's times we got to see Palestine getting off our national consciousness. 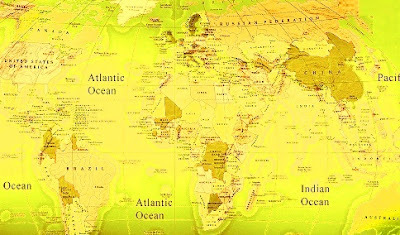 Now that everybody in India's middle and upper-middle class have found their Eldorado in US and software revolution has eclipsed all, politics, morality, international affairs, we give a damn to all. We just don't care what happens in the world except US and to an extent UK. Just to remind that there are 220 countries in this word! It is surprising how the ghazal....na kisii ki aaNkh ka nuur huun.....is often mentioned as Bahadur Shah Zafar's ghazal. I think it is because the meloncholic mood of this ghazal is similar to a popular ghazal by Zafar and it does reflect the similar pain which poet-King who was exiled might have undergone. Also, various versions of these ghazals got in circulation. Probably for their convenience some singers even mixed these ghazals and several forms of this ghazal with changes in order and sequence of words came in circulation. Muztar Khairabadi (1865-1927) was born in Khairabad in 1965. His mother Saeedunnisaa was a poet who gave him initial 'islaah'. Interestingly Muztar took 'islaah' from Amir Meenai but still chose the style of Dagh Dehlvi. He spent his life in Tonk where he was sessions judge. He is considered a giant among Urdu poets. His son Jaan Nisaar Akhtar and grandson Javed carry the legacy. Scores of his couplets are spread across Urdu world and used in daily conversation. Muztar ki qaadirul kalaami ka aalam tha ki muqaddame ka faisal filbadih manzuum sunaa dete the ie entire verdict of case in poetry, extempore. It is well-known that once Dagh had mistakenly recited Muztar's ghazal that was in the same style at a mushaira because he probably got confused.